As it’s evident by the name itself, other factors like food display remain the same, the only difference is that after helping himself the guest sits down to have his meals. The table setting required in this case is just like any other occasion. If there is wine to be served along with the food, glasses are put in advance on the tables and wine is served by the waiter. A meal of this kind requires more than the usual number of waiters as they are required to clear the soiled items in time and to ensure that all the service that is to be given on the table itself i.e. wines, cigarettes, and toward the end tea/coffee, can be served. A sit down buffet is as good as any formal meal and it serves a more successful in infusing a certain lightness in the atmosphere and at the same time remaining ‘formal’ also. As the name suggest, there is no provision of elaborate cutlery, hence the name ‘Fork Buffet’ since one can’t use a knife, so they use fork when one is eating while standing. Special care is taken in this kind of food. It must be made sure that it’s easy to eat and can be eaten with fork. Anything that would need a knife is avoided. 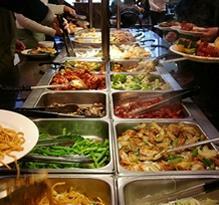 Curry, casseroles with rice and noodles, fish and meat salads are basically desirable and common items in this buffet. The guests select their food and then eat at a table. Here the guests approach the buffet at its various service points to select their requirements course by course. Most ancillary items may also be collected, if needed, at the buffet. These might include rolls, butter, sauces, napkin, tableware etc. The guests then return to their tables to consume the different parts of the meal. The table layouts are similar to the standard banquet layouts. The clearing of the tables takes place in the same way as for formal Banquets. Nice to know all these !!! I am having exm today still confuse about the types of buffet. 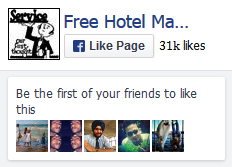 Its very good for me because i want join hotel management course. SO it will be very helpful for me. hi , Its good to explain so. Please let me know different types of buffet setups, layout etc. Finger buffet includes food that does not require cutlery to eat. Finger buffets are usually standing, set-up for cocktails or reception. Standing buffet does not require knife, and food is usually cut in small bits. You are right on the sit-down buffet. Thanks for your comment. I hope readers will read this and try to get appropriate information from their superior. please CLICK HERE: to get more resources..
Ram Krishna, next time I will not approve your comment. I had sent you email. If you need further service from me you have to pay otherwise just keep quit. You are just wasting your time. Stop it. Is it clear? Hi, thank you for your time and precious lesson. Please help me with specifying the difference between sit down buffet and display buffet/finger buffet, as I can’t distinguish their difference. Basically there is no difference, the only difference is that after helping himself the guest sits down to have his meals. In fact these classification is not so much important in practical purpose.